Paying tribute to the pioneering women who pushed open the door to opportunity during World War II, Mikron Theatre Company is back with a new show about the ‘Jenny Wrens’. The theatre company’s show ‘All Hands on Deck’, which opens at the LBT on Saturday, April 13 at 7.30pm, is a fun-filled nautical adventure about recruits to the Women’s Royal Navy Service (WRNS) - but it also serves as a powerfully relevant piece of British social history. Elizabeth Robin and Rachel Benson play new WRNS recruits Ginger and Lily who are looking for wartime adventure. Lily wants to serve on dry land but Ginger is desperate to go to sea. They plunge into unchartered waters with warmth, wit and a determination to succeed. 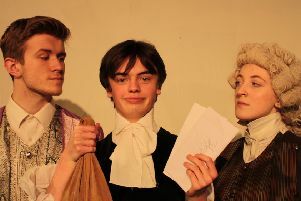 Mikron Theatre Company deliver uniquely British stories to community doorsteps, touring in spaces large and small, from theatres to parks and the back rooms of pubs. In 2018 Mikron performed their suffragette play ‘Revolting Women’ at the LBT. Now in their 44th year of touring, Mikron has secured funding which will see the company sail into their half-century on the road.